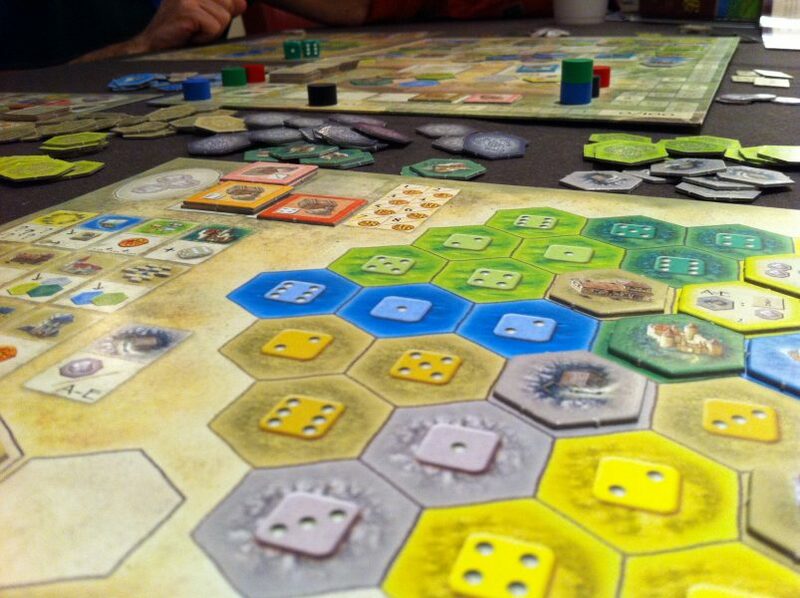 I couldn’t quite believe it when I found out that I haven’t actually reviewed Castles of Burgundy before. I suppose I was remembering the strategy guide I wrote and assumed I had reviewed it also. But alas! No classic Thoughtful Gamer criticism has been directed at this beautiful design yet. Time to fix that. But after a recommendation from a friend, and because of the inexpensive price, I decided to give Castles of Burgundy, Feld’s highest-rated game on BGG, a shot. Spoiler: it’s very good. Much has been said about the pastoral (some might say “ugly”) look of the game, but I really don’t mind. I think it has a pleasant look that fits the vague rural French theme. It’s unobtrusive and all of the iconography is clearly presented. I wish the player boards were thicker cardboard rather than card stock, and maybe I wish all the pieces had a little more space to breathe on the various boards, but considering that it’s easy to find Castles of Burgundy for about $25 here in the states it’s a steal. I think my reaction to Castles of Burgundy is similar to how people who like Bach react to his music. While I think Bach usually sounds overly mathematical and devoid of soul, others who know more about music than I do can hear the subtle precision with which he uses the language of music. They see the symmetry and cleverness and beauty contained in that superior example of the Baroque form. 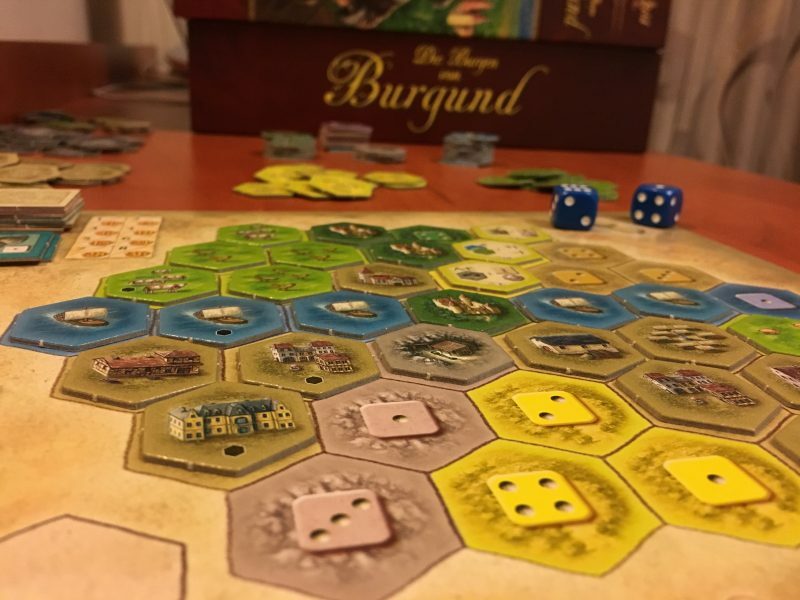 Similarly some people might be able to recognize that Castles of Burgundy is competently made but fail to understand why I find it so exciting and beautifully designed. Every part of the game’s mechanisms both make sense and exhibit some kind of genius mathematical symmetry. There are five rounds of five turns each. On each turn, all the players get to use two dice to do actions–so 50 total actions. Before each turn a die is rolled to send one of the six (one for each die face) goods to one of the six (ditto) locations on the board. Around the outside of where the goods go a number of hexagons are arranged. You’ll be using those to fill out your estate on your player board. By placing those tiles you’ll generate points. How do you place the tiles? Well you first have to get them from the main board by spending one of your dice. That sends a hex to a sort of holding pen on your board. Then you spend another die to place it on your board matching the color of the piece and the face of the die you spent. Essentially that’s it. Roll two dice, spend them to get and place hexes. Do that 25 times and you’re done. There are silver pieces you can acquire to buy additional hexes from a special area of the board, and you can accumulate “workers” which let you manipulate your dice. But the core of the game is dice–>hex. From that simple premise a number of interesting interactions occur. There are a number of player boards with different arrangements of hexagons for variety. This matters because you can only place a new hex adjacent to one you already have on the board, and because points are given out for completing regions on the board–that is, self contained sections of the same color. The best and worst boards. Completing regions is so important because of the way they’re scored. Larger regions score more points (in a nice triangle-number formula), but there’s a bonus of 2-10 points given depending on in which round you complete the region. Much of the strategy revolves around pushing your luck with this. Do I spend two workers to secure those additional two points now, or use my die for a helpful but not immediately-point scoring move and hope I get the roll I need to complete the region next round? In a game where final scores can easily surpass 200, a 2 point difference from round to round doesn’t seem like much, but it adds up over the course of the game. In reality, fitting with the Feldian “point salad” structure, there’s a floor of around 150 points for any given game and a ceiling of about 220-250 (depending on player count), so scores are not as variable as you might think. On one hand, I understand the arguments for the idea that a soft point floor is inelegant design, but I also appreciate that it’s nice to get points. In Castles of Burgundy this doesn’t bother me, because points are gained so frequently and they’re typically easy enough to calculate quickly. There are also legitimate strategies that maximize either early game or late game gain (going for the 8-sized region on board 2 can be particularly dramatic), and watching the player’s point-cylinders race around the track is appropriately exciting. Each of the different colors of hexes provide unique powers when you place them. The tan buildings and green castles typically give you a power equal to one die. 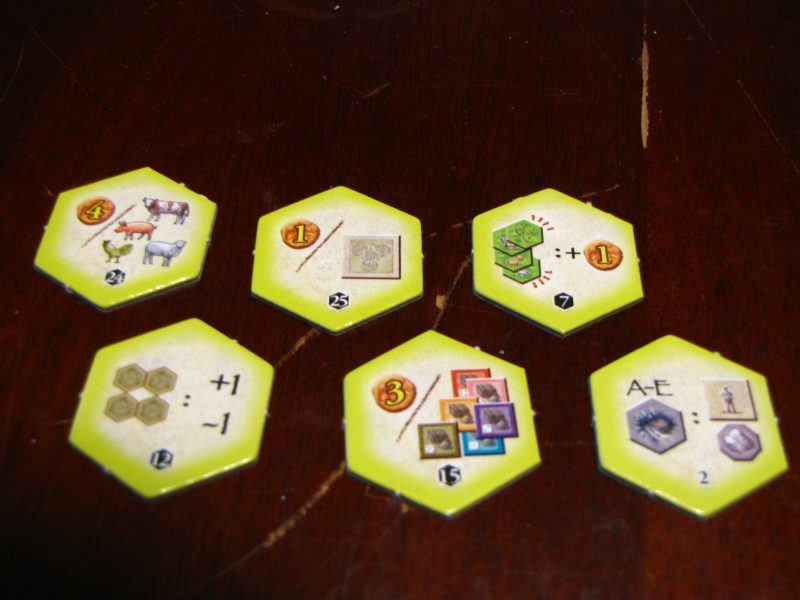 For instance, one building lets you immediately place another hex on the board without using a die. Others allow you to grab a particular color of hex from the main board, or ship one type of good. The castles simply give you a free action of whatever you want. So the castles are strictly better? Kind of, since on most boards they’re in regions of 1 that can score big points early game. But there are also far fewer of them available so you might spend workers or even dice (which can always be cashed in for 2 workers) to grab that tile before someone else. Is that worth it? Depends. The light green farm tiles have different groupings of animals on them, and they have the biggest point potential, since each time you play one of them you score points equal to the total count of that type of animal in that region. Have a large 5-size farm space on your board? Fill it up with entirely cows or pigs and you’re going to be flying past everyone on the score track. But, of course, everyone else is also tempted to try to cash in with animals, and even if they don’t they can see exactly what tiles you need to make bank and you know your friends would love to ruin all of your hopes and dreams. Of course, you can avoid that by getting ahead in the turn order, which requires placing ship hexes. They let you jump ahead of your opponents in priority and also allow you to collect the goods that have been accumulating each turn. But farm and ship tiles don’t have a clear cut “one-die” benefit that the city and castle tiles do, so if you go for them exclusively you’ll end up placing fewer overall tiles which probably means fewer regions completed, which means fewer points from those regions. Worth it? Depends. Yellow knowledge tiles provide some kind of passive or end-game bonus. They can make your workers more powerful, give bonuses for shipping goods, or provide additional points for constructing certain types of buildings. A given knowledge tile may be more helpful at the beginning of the game and relatively useless at the end. Some of them are best with certain player boards and not others. Some potentially score a large number of points and are going to be fought over. Similarly, grey mine tiles are incredibly valuable early in the game, as they provide a passive income of silver (each of which is worth half a die because two of them can purchase one tile from the center “black market”), but they’re quite useless in the last round because it’s too late to reasonably profit from the silver they give you. Each individual type of hex has its own strengths and weaknesses. Buildings are plentiful and help you economize actions, but otherwise worthless unless used to complete a region. Farms are a intra-game push your luck game in and of themselves with significant consequences. Keeping ahead of the turn order can become a mutually destructive tug of war between players intent on going first. And check out this bit of mathematical symmetry–the two strongest types of tiles (castles and mines) have only 3 open spaces on each board. Buildings take up 12 spaces, and everything else gets 6. You’re not going to be able to do everything you want to do, but you will be able to do most of it. At the end of the game you’ll probably only have about 6-8 spaces left uncovered, so you need to plan for what you want those spaces to be. But since there are so many actions in the game you can be tactically flexible and go with what the dice give you. There’s simultaneously tension and flexibility. The winner will win on the margin, through good play throughout, and even though it’s a dice game you will rarely feel like randomness was the reason for your failure or success. Recall my review of Tokaido where I talk about how on any given turn it gives you only a couple of reasonable options, and your job is to pick from that limited selection. 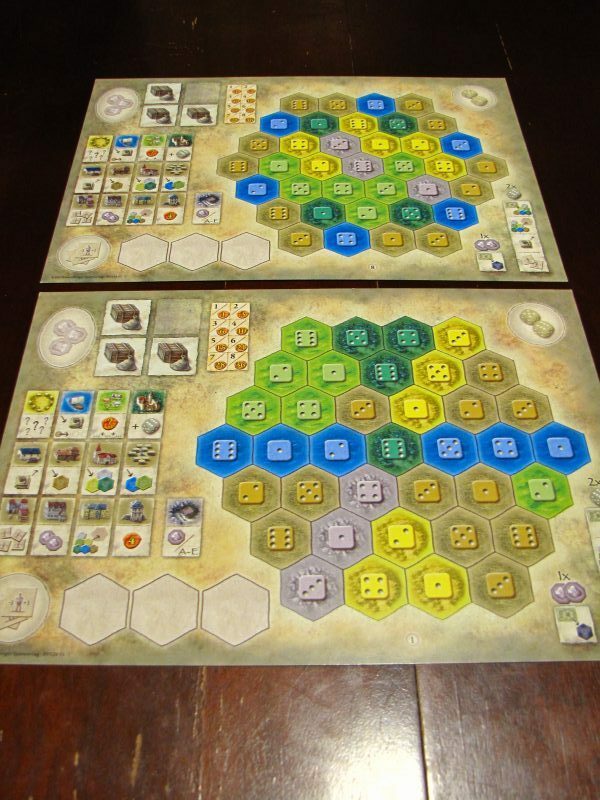 The Castles of Burgundy is like that but a step more complex. The dice will give you a few options and you need to figure out your turn from that continually shifting decision space. The dice aren’t there to punish you with randomness, but to limit the scope of your analysis to keep the game moving. Making the right decision is at once simple and opaque. You can easily calculate the potential point value of a given turn due to those simple calculations I keep throwing around, but you’re also dealing with nebulous concepts of decision flexibility in future turns and the uncertainty of what the dice and your opponents will do. Thus, Castles of Burgundy fits into the perfect mid-weight euro category where there’s a good amount of strategy without it becoming overwhelming. You’re looking at around 30 minutes per player, but there’s so little downtime because each turn is a quick two step process. There are variables to consider, but they’re restrained and subdued by the dice. The game gives you a little bit of space to block other players (more significant in a 2 player game), and that’s plenty because even stealing one tile at the right time can significantly tip the scales. At the same time it doesn’t necessarily feel like a mean game. Everyone’s building up on their own little board and having a fine time with the puzzle. Ultimately Castles of Burgundy is an exceedingly self-assured game. Every part of it feels, at once, intentional and necessary. All of the mechanisms lock into themselves like a puzzle and the result is a game that feels like a classic. I’ve played a few other Feld games since but none of them have been so precise, pleasant, and accessible as this one. A true delight.